Veil of Alaris – Day One #EQ #EverQuest – Nomadic Gamers, eh! Yesterday was the release of EverQuest’s 18th expansion, Veil of Alaris. The game was down for 8 hours and servers came back up on time, but that’s not to say that the release was completely flawless, there were a few issues players experienced. The largest one was that unless you purchased VoA you were unable to access your potion belt, something that’s been in game for a little while now and allows players to use potions from within their bags by hotkeying them. With the newly revamped hotkeys something in the code messed up. It’s going to be fixed in a future update though so don’t be too concerned. There were also a few issues people had with the changes to guild rosters, you can name ranks and assign them properties much like you can in EQ2 (and I am so glad to see it). My first day playing VoA wasn’t spent IN VoA so much as exploring the features that had been added. The biggest change for me was the one to hotbars. Players are now able to open 10 hotbars at once, and customize them in a large number of ways. You can resize them into different rows and as big or small as you’d like. This makes reading my hotbars much easier, as before the lettering on the buttons was so tiny I could barely make it out. I picked up a new mercenary, one that comes with the VoA expansion, pictured above. 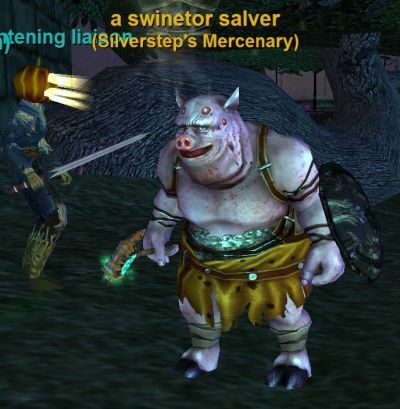 The swinetor salver is a healer mercenary, and played just fine alongside my shadowknight in Ssra (the level 55 hot zone). I’m really glad that mounts no longer glide to a stop, they have an instant stop-go motion, something that was released a few patches ago and had nothing to do with VoA. The games population (at least on my server) is still nice and busy, which I was happy to see. I’m hoping that today I get to explore some of the zones and get into some trouble. We’ll just have to see. My 90 enchanter now has 5 more levels to climb, although from what I saw in chat channels last night some players already hit the new level cap. Since there’s so much to do in EQ I don’t really see it as being much of a problem, they can grind out the rest of their EQ days working on progression and alternate advancement, where it’s quite normal to see players with upwards of 5,000 aa.